These Malted Milk Blondies are from Baked: New Frontiers in Baking . The book, which is by the owners of the famous bakery in Brooklyn, has all kinds of recipes with clever little twists; for instance, blondies with malt. Baked calls the blondies “Brewer’s Brownies” because they use malt from a local brewery. But knowing that people might have difficulties getting actual malt, they modified the recipe so that it could be made with more readily attainable malted milk powder such as Carnation, Ovaltine or Horlick’s. If you’re not ready to buy the book yet, you can grab the original recipe off NPR or use my half-batch modified version the Baked Malted Milk Blondies (aka Brewer’s Blondies). Chocolate chip bars or blondies made with malt balls and malted milk powder. Preheat the oven to 350 degrees F. Line an 8 inch metal pan with non-stick foil or line with regular foil and spray with cooking spray. Combine the flour, baking powder, salt and malted milk powder; stir well and set aside. Bake in the center of the oven for 25 to 27 minutes, or until a toothpick inserted into the center of the blondies comes out clean. Transfer to a wire rack and let cool. Grasp foil, lift from pan and score into 12 bars. The guys from Bake say these are good warm. I'm sure they are, but I liked them better after they’d set. I finally made these, mine took a few extra minutes to bake. My malted milk powder was hard as a rock, but I chiseled some off and zapped it in my mini food-processor and it came back to life. These are just great. Thanks! I made these a month or so ago, and they are amazing! My husband is a huge fan of anything malt-flavored, so I sent them to work with him to get them out of the house. They were gone in no time! Ooh yum! I LOVED the Baked brownies recipe and I happen to have some malted milk powder! I’m gonna have to make theseeee! i don’t really like malt balls but these look so soft and gooey! yummy! 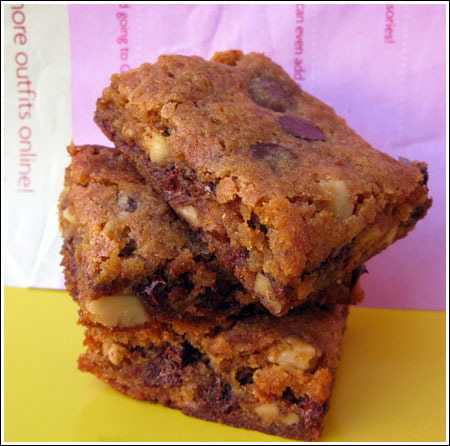 OMG, these blondies look sooooo good….I seem to have developed a weakness for blondies lately. Thanks, Anna! I love malted milk balls more than life, especially espresso milk chocolate milk balls. These blondies will do it, too. Thank you! I’ve been eying this recipe for quite some time. Looking at your pictures, now I know I have to make these right now! They look soooo good! These look great, I love malt, gotta pick up a couple of pouches of Whoppers and I will be making these very soon. One thing I didn’t mention above was that they have a really good malt flavor. Even with only a tablespoon of malt powder (for the half version) they’re malty. Thanks! I was wondering if maybe they were similar. Joanna, here’s another recipe that might be similar. The Baked chocolate cloud cookies are similar to Francois Payard’s chocolate cookies, Maida Heatter’s Savannah Chocolate Chewies, aka Gottlieb’s chocolate chewies. A dark cocoa, sugar and egg white base with finely chopped nuts. These look incredible. I love that they have the malt powder, but also the malted milk balls and walnuts. Ooooooo!!! Thanks Anna! These look awesome! I will definitely have to try them out. I love malt anything! I FINALLY broke down and bought that cookbook. It is amazing. Those pb & choco cookies, oh my word. But that root beer bundt cake was out of this world. I will have to try these blondies. About Baked–I went to the Charleston shop recently and was so impressed with their desserts. They are known for their brownies & blondies, but actually, my favorite item was the Chocolate Cloud cookie! I don’t know if you’ve ever heard of them, but they are dark, rich, and chewy. Crackly on the outside and gooey in the middle with a very shiny appearance. I’ve been trying to recreate the recipe ever since and haven’t quite gotten it yet–but the Shiny Happy Choc. Cookies you made are a close second! I’d be interested to see if other bloggers have given a Baked Chocolate Cloud Copycat recipe a try! Thanks again for your dedication to the baking world!